Go-getter Mars moves into Sagittarius this Friday, 26 Jan, upping energy levels everywhere. You’ll find a spring in your step and a zing in your comebacks with Mars in Sagittarius, and it’s all good so long as we take care not to overdo the burn – there’s always a kind(er) way to tell your sister she looks fat in that dress – and channel our energies into productive pursuits. Mars in Sagittarius is great for making business plans and taking action on said plans, especially those requiring overseas expansion. Similarly, if you’ve been thinking of further studies or a skills upgrading course, this is a good time to make some headway on those grand schemes. So let’s get to our reading and make it snappy! LEFT: SEVEN OF WANDS REVERSED. There’s a time for self-assertion, and a time for lying low. This week, it’s wiser to cooperate with others, blend in, and not stick out quite so much. Practise selective hearing and ignore people who try to challenge you unless it’s necessary to clarify the truth. MIDDLE: SEVEN OF SWORDS REVERSED. This card is associated with lone wolves, thieves, and a certain level of deception + trickery. In reverse, you’re advised to stay on the side of the righteous, as well as to reach out if you need help. Again, the element of cooperating + getting along with others is clear here. This is also the second Number Seven card in the spread. In numerology, Seven is associated with spiritual learning, growth, and breakthrough. Look out for learning points in your interactions with others this week – Spirit can speak to you through everyday incidents, and you might just get the message you’ve been waiting for. RIGHT: TEN OF WANDS. This card represents the pinnacle of achievement, and the weariness that can result from taking on the responsibilities associated with those achievements. Be mindful of what you’ve decided to take upon your shoulders, but once you’re sure of the burden you’ve chosen to bear, push through with it – you’ll be fine. BE BLESSED: MESSAGE IN A BOTTLE. 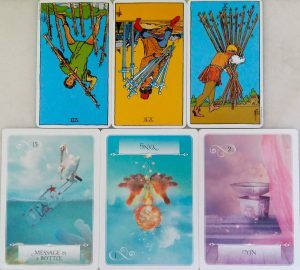 It seems that communication and messages are key to this week’s reading! This card is a reaffirmation from Spirit that a message will be sent to us this week if we’re willing to accept it – and this message will be beneficial, healing, and inspiring to our growth. This card is also a reminder that we are to bless others with our communication, so be aware of how you get your point across to others. BE CAREFUL: YANG (PROTECTION POSITION). When this card appears upside down, it’s a strong warning against hasty + aggressive action that will almost certainly lead to regrettable outcomes. Be kind, diplomatic, and gentle in your approach – you catch more flies with honey than with vinegar, as the saying goes. BE ADVISED: YIN. Yin, the receptive female energy, is the opposite of Yang, the active male energy. This week, we’re very clearly instructed to avoid belligerent, bullying, and over-the-top behaviour. We can make our point just as powerfully with subtle gestures, discreet actions, and the refusal to engage in pointless bickering (which is the shadow side of Mars in Sagittarius – noisy and futile aggression). Kindness and compassion go a long way, bbs.